Step wise process for opening SBI Savings Bank New Account Online Application Form and SBI New Account Online Form in State Bank of India website…..
1. To fill the Online application form first got to this link, Go Here. 3. Now fill the Customer Information Section which needs to be filled by each person who wish to open the account. 4. Here you can see three sections in Customer Type Information Section they are Personal Details, Additional Details and Identification. The Part A must be filled first then save the form, which will generate a Temporary Customer Reference Number (TCRN) for future reference. Actually What is TCRN in SBI? So many appliers has confused the TCRN. 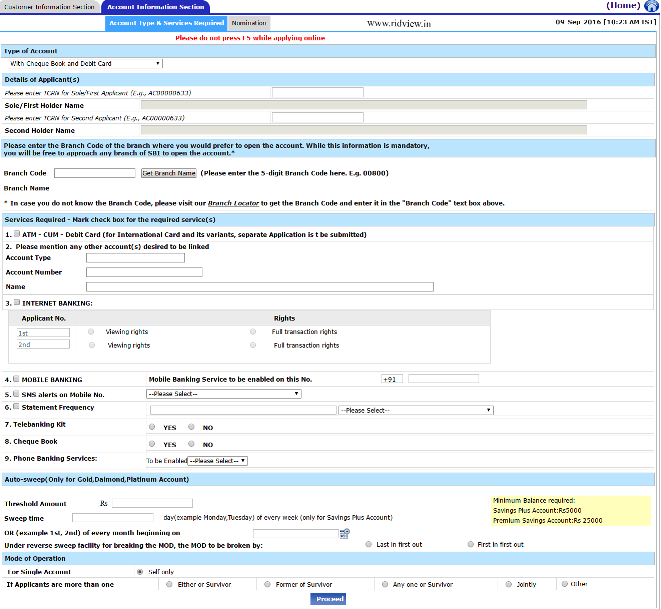 The SBI TCRN for Sole can be used to edit your form in future. Complete the remaining parts also subsequently. 5. Now fill the Account Information Section which contains two parts, Part A (Type of Account and Services Required), Part B (Nomination Form (optional but recommended). After completing these and submitting will give you a Temporary Account Reference Number (TARN) number, which is needed to edit this part of the application. 6. After successfully completing the above two steps you can print the Account Opening Form (AOF) on A4 size white papers. 7. Also attach all the required documents (i.e. KYC documents), such as photographs and proof of identity and address, as mentioned in the AOF. 8. TCRN and TARN numbers will also be sent on the registered mobile number of the applicant(s). KYC documents as mentioned in the AOF. Carry the original proofs along with the photocopies. The customers are also advised to read all the rules and regulations of the savings bank account before signing the SBI SB Account Opening Form. Each and Every SBI employee must follow the below procedure to know to how to create an account in State Bank Enterprise Messaging System…..
Dude each and every job holder in SBI don’t forget your Email id and Password, the officials who had provided you at the time of the user creation. Actually it takes one working day to create email ids. If anybody have cannot access or can’t activated your EMS after 1 day of registration, then please contact your circle admin / ITS Dept. Using your EMS Login regularly a request will send the user to change password in each 90 days. If you can’t change your password it will expire When you’ve got not modified password in final ninety days.